If you experience any technical issues please get in touch with our Customer Care Team straight away. Most issues such as loss of sound or crashing are usually down to the installation process or local device settings, not the app, and are very easily fixed. Our website contains a wide range of easy to understand help articles which can be read on‐line or downloaded as pdfs. Click on the link below to view the latest article relating to this app. 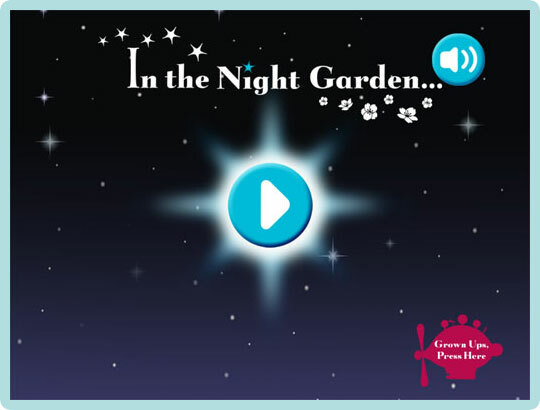 Fans of the hit CBeebies TV show can now explore the enchanting world of In The Night Garden in this fun interactive app. 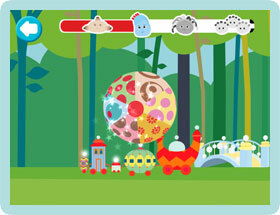 Ideal for younger pre-school children, this playtime app is available for both iOS and Android devices. P2 Kid Safe App. P2 Kid Safe apps DO NOT contain in-app purchasing or data gathering systems of any kind, meaning your children can safely play without fear of unwittingly purchasing app content or credits, or disclosing data about their playing habits, location or the device they are using. the game to go back to the previous menu. game to quit the current activity. the introduction and move to the Main Menu screen. Use this button to turn the music on or off. If you want to turn the voice over instructions off, use the mute button on your device. This is the 'Play' button. 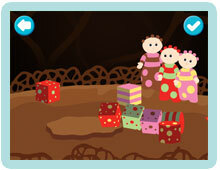 Press the glowing 'Play' button to start the introduction to the app. After pressing the 'Play' button, an interactive version of the opening sequence of the TV show will begin. 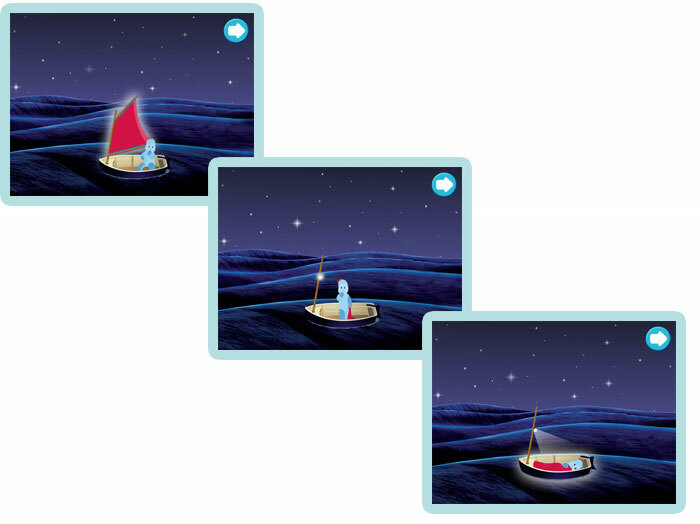 You will be prompted by the narrator to 'take the little sail down', 'light the little light' and to 'touch Igglepiggle's boat to watch him sail out of sight'. Touching at any stage will allow you to skip this interactive section and move straight to the Main Menu. 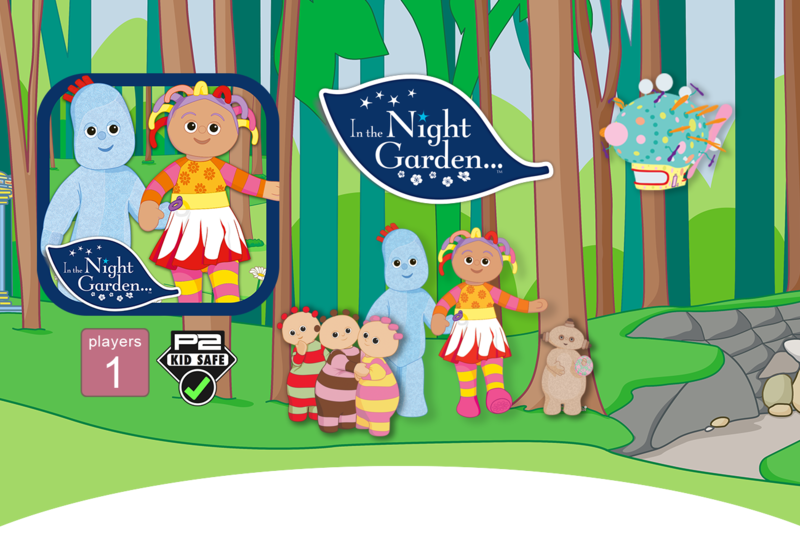 It's now time to jump aboard the Ninky Nonk with your favourite characters - Igglepiggle, Upsy Daisy, Makka Pakka and the Tombliboos . Press any of the Characters to choose the game you want to play. 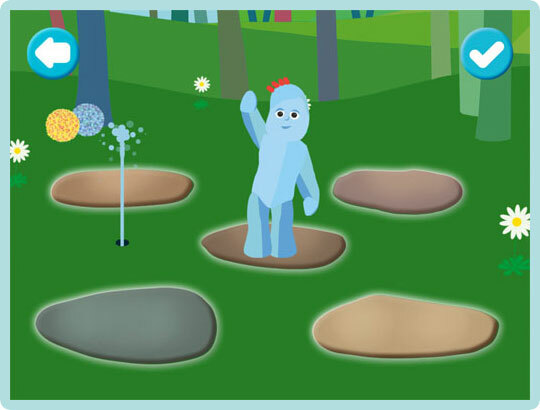 Igglepiggle is in the garden and has come across five stepping-stones and a tiddle! Touch a stone to make Igglepiggle jump to that stone. The stone will make a funny sound. 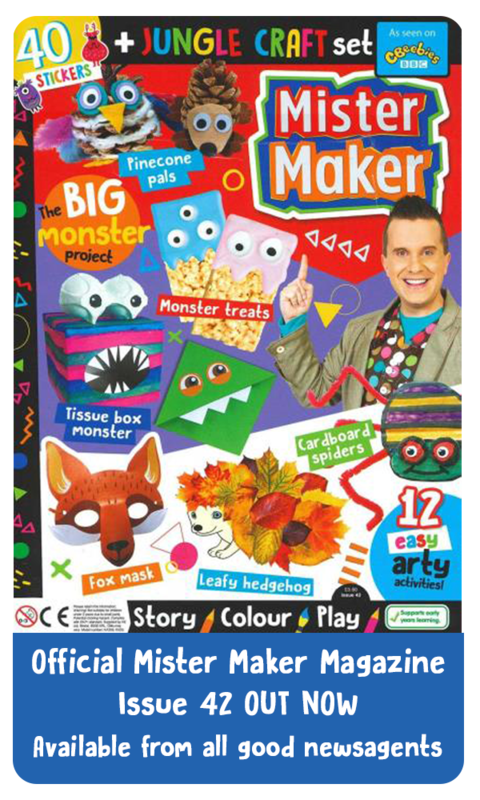 See what different funny noises you can find and touch the tiddle to see what happens? Have fun playing for as long as you like. 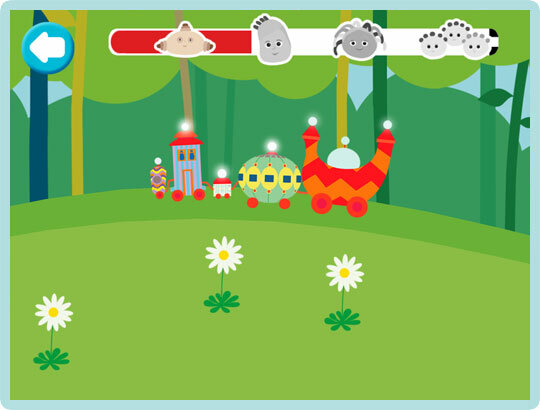 When you've finished playing stepping stones, touch the button to see Igglepiggle's dance. 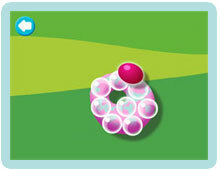 Touch the button to end the game and return straight to the Main Menu screen where you can choose another game. Makka Pakka is in the garden and he is going to wash his friends' faces. Choose which face you want to wash by touching Igglepiggle, the Tombliboos or Upsy Daisy. First touch the soap and rub it on the sponge to make soapy bubbles. Then touch the sponge and rub it all over your favourite character's face. Touch the button at any time to return to the character selection screen so you can choose another face to wash. 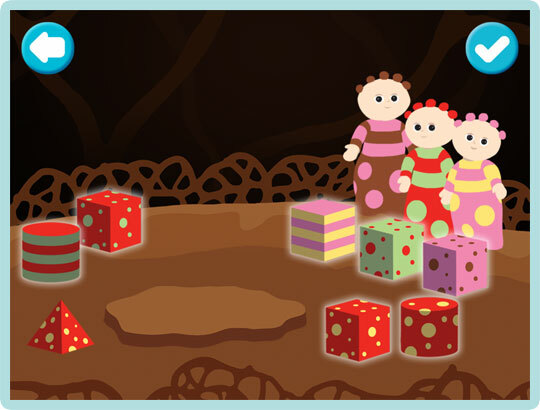 When you've finished helping Makka Pakka wash faces, touch the button to see Makka Pakka's dance. 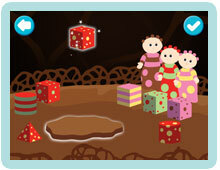 The Tombliboos are playing with their building blocks. 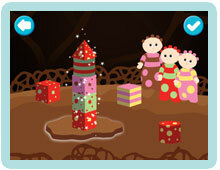 See if you can help them build a tower. 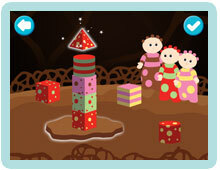 Build a tower by dropping blocks on top of one another above the Tombliboo's platform. Start by touching a glowing block. Touch above the platform to make the block drop. Keep touching the glowing blocks until you have made a tower of 5 bricks. The pointed brick goes on the top of the tower and can only be selected as the last brick. Now touch the tower to knock it down! When you've finished building towers touch the button to see the Tombliboo's dance. Here's Upsy Daisy but she is looking very pale! Can you make her all bright and colourful? Colour Upsy Daisy all over with the crayon to colour in the pink. Now colour in the orange, yellow, red and Upsy Daisy's face and hands. Touch Upsy Daisy to stamp the flowers on her top. 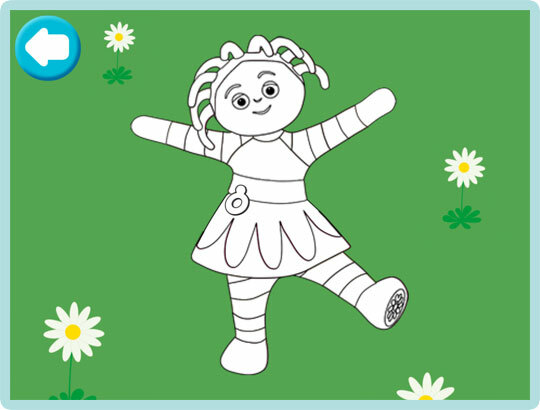 Now pull Upsy Daisy's cord to see her dance. Everyone is going for a ride in the Ninky Nonk. Help them collect their favourite things. Touch the screen to make the Ninky Nonk go. The faster you tap the screen, the faster the Ninky Nonk goes. Stop tapping to make the Ninky Nonk stop. 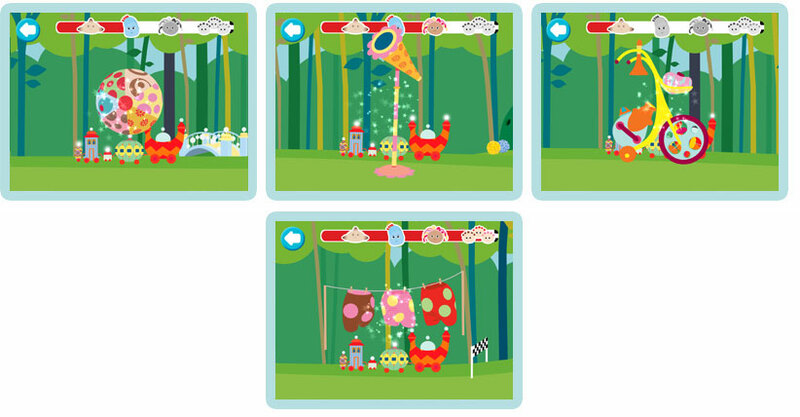 Touch Igglepiggle's ball, Upsy Daisy's megaphone, Makka Pakka's Og-Pop and the Tombliboo's trousers when they appear to pick them up. Touch the different carriages at any time to hear some fun sounds.